CXHairs course expert: Kong (on left). [Editor’s Note: As I write this, the event may be canceled. 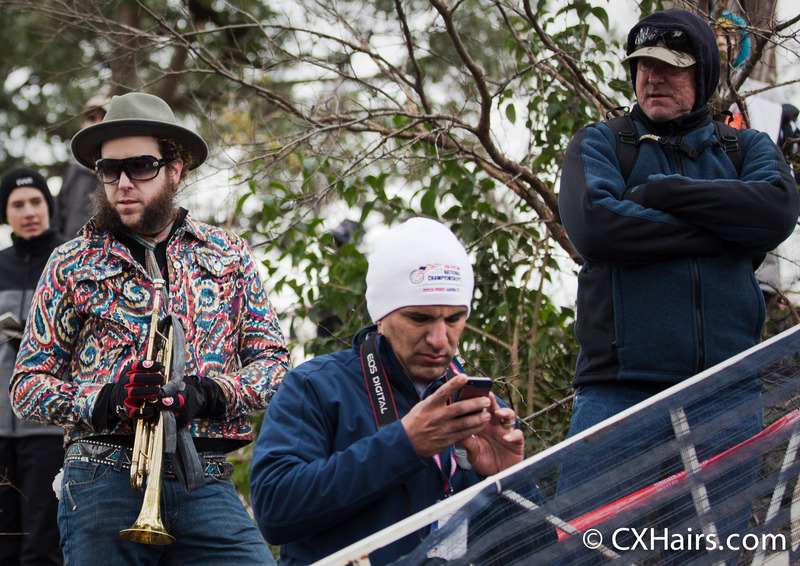 With the hope it isn’t, I will post regardless] Before the Elite races go off today at Zilker Park in Austin, Texas, we have two interviews and a spur of the moment Your Moment of SVENNESS to get you ready for the races. The rain hit hard, yesterday, and increased overnight. Today is is going to be sloppy one. After filming the conditions, I looked around for some riders to ask about the course. But most of them were doing there job, dialing in lines on the course (more on that in the YMOS episode). So instead of finding a rider, I found a spectator. First up, here is Kong with the rundown on Austin cycling and today’s races. Next up we have a quick chat with Stephen Hyde, who had done his recon and was cooling down in the Rapha-Focus tent. We spoke to a clean-shaven Hyde at the beginning of the season, and everything has gone better than planned up to this point. Stephen gives us his thoughts on Sunday’s men’s elite race and his near future plans. Finally, we took some time to gather some video of the elite men previewing the course. The meticulous nature in which these guys go back and dial in the course. The meticulous nature in how you pre-ride a course is an important element in doing well. Especially when the conditions are incredibly difficult like they will be today at Zilker Park. Thanks to Rusty Williford and Raul Rojas for the additional footage. Power totally had those slick downhill lines mastered in yesterday’s race. That was awesome to watch. Also, in the junior’s race I heard the announcers use the term “sven line” as a junior took a whole different (and better) line than the rest of his group in a slick corner. The world is a better place with cxhairs in it. You are the man and I love these videos. Thanks so much for all the videos. They are sooo fun to watch. I’m hoping to see “YMOS 1.4B” where we see Powers vs. all the others in that off camber turn with the stake. It sure looked like he rode that noticeably better on Monday, compared with all the others.